Santanu Das speaks of going beyond the history of medals and memorials to 'worlds of feeling and experience' in his new book. Today is a hundred years since the Armistice – the end of the First World War. Close to a million Indian troops served in the Great War, though their role – in the trenches, and through every theatre of the war – has been neglected in both histories and fiction. 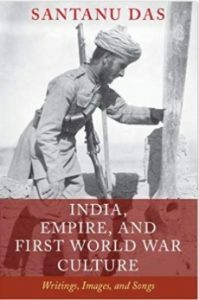 Professor Santanu Das, of King’s College London, helps to fill the void with his book India, Empire and First World War Culture: Writings, Images, and Songs (Cambridge, 2018). The book opens up the world of Indian combatants, labourers, civilians and writers during WW1 and recovers an important cultural legacy and emotional history for the subcontinent. India, Empire and First World War Culture has been a product of over ten years of research, as you mention at the start of the book. What piqued your curiosity about Indians in the First World War and why did it take you so long? When I was finishing Touch and Intimacy in First World War Literature, I naturally started wondering about what the experience would have been for the over one million Indians, both combatants and non-combatants, who served in places as far-flung as Europe and Mesopotamia and Gallipoli and East Africa. I wanted to go beyond both the grand narrative of the ‘Great War and modern memory’ and the military WW1 of the ‘vital contribution of Indians to the First World War’ and excavate their worlds of feeling and experience as they encountered new lands and people, lived daily lives behind the trenches – eating, grooming, laughing, chatting, smoking, working – and faced industrial warfare for the first time. So the twin aims were to challenge the colour of war memory and provide a history not sealed up in medals and memorials but more palpable, intimate and plural. But I also wanted to move beyond the story of the sepoy to locate the First World War in the socio-cultural, literary and intellectual history of India… heated debates in newspapers about India’s war participation, the recruitment speeches of Mahatma Gandhi, women’s folk-songs in Punjab. From fictional representations of sepoys by writers as diverse as Rudyard Kipling and Mulk Raj Anand, to the imagining of a post-war world by intellectuals such as Mohammed Iqbal and Rabindranath Tagore, the country’s involvement in the war produced a distinct and recognisable culture. Your choice of methodology in the book is fascinating… You combine interpretations of material, visual, aural and textual sources. Why such an eclectic approach? And how did you select your material for these comparative readings? Well, most sepoys did not know how to read or write. They didn’t leave behind the abundance of documents that form the cornerstone of European war memory. I needed to go beyond the written and the textual to the visual, the aural and even the tactile. I had to reconceptualise what constitutes the ‘archive’: photos, paintings, portraits, oral performances, reports of rumours and gossip, sound-recordings and songs, as well as testimonial, literary and political writings. The research took me from villages of Punjab to battlefields and POW camps and cemeteries – Ypres and Wunsdorf and Dar Es Salam – to museums across Australia and New Zealand. It is important to de-Europeanise our research methodology as well as our sources, and think carefully what questions we should ask of our sources. And I have tried to ‘read’ different sources and forms in relation to each other; one fragment may change meaning when considered alongside another and open up a whole new world. What might readers find most surprising about this book? I think the artefacts and voice-recordings – I found them intensely moving – and hopefully the questions I ask of them. In the Dupleix Museum in Chandernagore, I found the bloodstained glasses of ‘Jon Sen’ who, I later found out, was the only non-white member of the Leeds Pals Battalion. 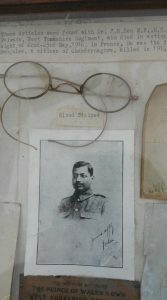 He was killed on 22-23 May, 1916 – and it was uncanny to see the glasses with their arms curving around the photograph of their master wearing them, as if locked in protective embrace. Or the remarkable notebook of Mir Mast, one of the few deserters, I came across in the National Archives. I was expecting words such as ‘jihad’ or ‘nationalism’ but what I found was a list of words, first in Urdu and in English translations, starting with ‘potato’ and ‘parsnips’ but swiftly becoming a catalogue of intimate body parts of both men and women: ‘penus’, ‘brests’, ‘harsole’ (sic)! Why did the men enlist? Today, these Indian sepoys are turned either into loyalist imperial heroes or colonial cannon-fodder. We seem to forget that the army, for most of these men, was a source of livelihood. But we also need to find a more psychologically nuanced framework to understand their inner worlds. Money of course was the main incentive, but fused and confused with social aspiration, family traditions, land grants, masculinity and vestigial sense of ‘izzat‘ (whatever that may mean!). Is there much Indian literature of the First World War? 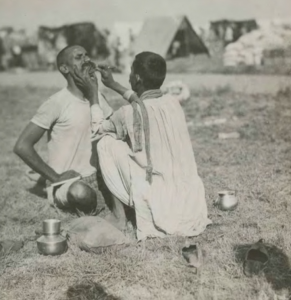 A history of India and the First World War is necessarily a history of fugitive fragments. Literature for me fills in the gaps left by history. A constant revelation has been the richness and diversity of the literature I have managed to recover over the last ten years – from remarkable memoirs or a former soldier’s 2000-line long qissa Vada Jung Europe, to anti-war pamphlets and subversive anthologies such as the remarkable Bahar-i-Jarman (‘Spring of the Germans’). A major plank of the book has been the translation of freshly discovered war memoirs and verses, from Punjabi, Urdu, Gujrati and Bengali. I have also drawn upon short stories and poetry, and the more elite literary responses such as Rabindranath Tagore’s essays on ‘Nationalism’ – written in the context of the war, but so eerily apt for our times. The images and metaphors are not just communicative gestures but repositories of feeling, rooted in the agricultural world of Punjab. A whole generation of men who had grown up listening to stories now starts scripting or dictating them. 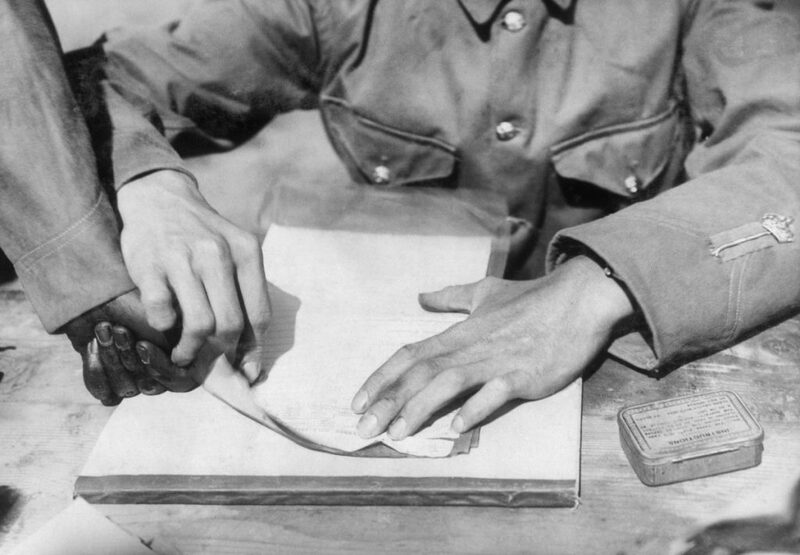 These letters can be read as Indian literature of the trenches: these men may have been non-literate but are intensely literary. You use an evocative phrase – ‘the colour of war memory’. What would you say is its shade today, at the time of the centenary? One of the important legacies of the centennial commemoration will be the greater recognition of the role of non-white soldiers and the recovery of fresh material. In Britain, the First World War is being reinvented as the grand stage to play the tune of multiculturalism. So there has been a challenge to the ‘colour of war memory’ but, in the process, there has also been a sanitisation of both war and empire. The Indian sepoys are turned into loyalist imperial heroes and brothers-in-arms, as if gallantry is the only ticket to success; the racism of the British Indian army or the colonial world order gets brushed under the agenda for social cohesion. Commemoration slips into celebration. Moreover, we forget that these are histories of violence and trauma. As we head towards the centenary of the Versailles Treaty, it is important more than ever to look at these messy, painful and unattractive histories in the eye. It is important not just to ‘commemorate’ but to create a more critical and reflective space about what we commemorate and why.